Once you have the ‘fiber fever’ there is nothing like choosing your very own fleece, fresh off the sheep to create an original work of art! 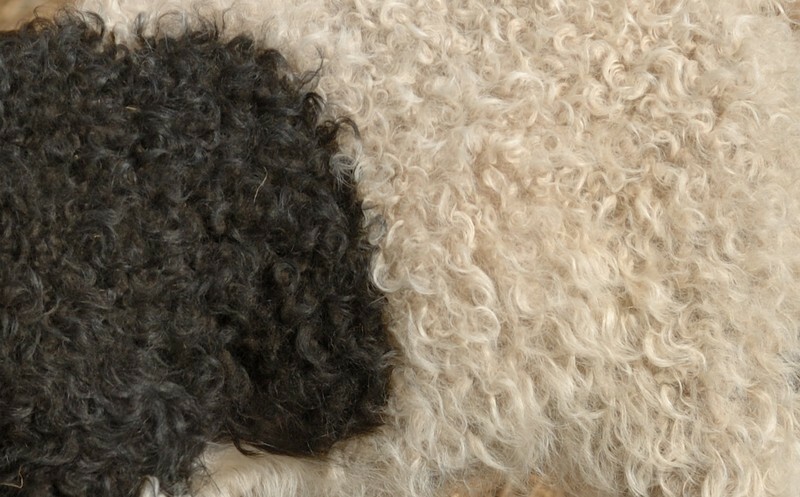 But first, before you become overwhelmed by the variety, the smells and the shear excitement of choosing a fleece of your very own, you must learn to recognize the difference between ‘good’ and ‘bad’ fleece qualities. We know that the best way to buy a fleece is in person at the farm or fiber fest. Purchasing from eBay or over the internet can be a lesson in what not to purchase. Before purchasing site unseen, be sure to check out the sellers reputation. There are many excellent farmers who only sell quality fleeces, once you find one be sure to keep their information for future purchases. It is not possible, nor is it practical for all fiber animals to be covered to protect their fleeces. Icelandic sheep with their double fast growing coats would suffer horrible under a canvas coat. Angora goats would find all kinds of interesting ways to rub the coat off and then would probably eat it! So just because a fleece is not covered does not mean that it is bad or full of VM (Vegetable Matter). As a matter of discussion, I have seen and been unimpressed with several fleeces that came from covered sheep. In the lists below we are looking for a perfect fleece any deviation will cause the price to be lower or will cause us to skip the fleece in search for a better one. The fleece should have a fresh animal smell, not stale or moldy, if there is a sour smell or if the fleece is sticky then it is likely to be over a year old. It will take more cleaning and freshening but could still be a nice fleece if you want to take the time to work with it. If a sheep or a mohair fleece – the grease should be soft, not sticky or gritty (alpaca does not have grease). Make sure there are no icky bits – burs, dung tags, sticks and/or straw will devalue the fleece. The tips should not be matted or sunburned. There should not be any second cuts – short fibers that are cut on both ends. Select 2 locks of the fleece, 1 from the edge and 1 from the center and perform the following tests on both locks. Stretch the lock out between your fingers, a good quality fleece will feel strong. Hold the ends of the lock one end in each hand, give it a good snap, if it breaks or bits of fiber crumble into your hands then it is a bad fleece do not purchase it. Next hold the lock up to your ear and give it a little stretch, if you hear crackling noises then it is a bad fleece do not purchase it. Lastly, notice the length of the lock it should be between 3″ and 5″ in length, shorter is difficult to keep together and longer than 6″ causes difficulty in drafting. Although depending on your project, shorter or longer fiber may be needed. Fleeces also differ in the amount of grease that they contain, generally speaking the finer the fleece (Merino, Romney) the more lanolin that it will contain, so make sure the price reflects the fact that you will lose 40 to 55% of the weight in lanolin. One last thing to keep in mind is that all farms are different, all shepherds have different goals, and each sheep is an individual within it’s breed, so every fleece is different, even from the same sheep the fleece can differ because of weather, age, sickness, change in feed, change in environment and/or lambing.